The Brevard House in Edgefield. Having trouble getting into the Holiday Spirit? 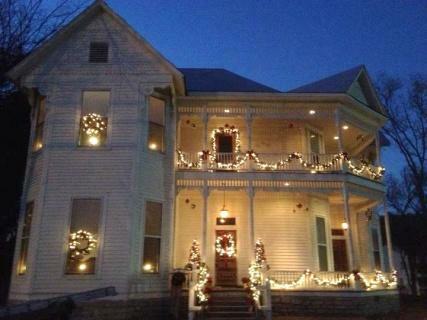 Woodbury Lions Club has the solution for you in the form of its annual Christmas Home Tour on Saturday, Dec. 1 from 4 to 8 p.m.
* "The Corners," in Readyville, built in 1829 by Charles Ready and presently owned and occupied by Bob and Karen Ford. * Brevard House in Edgefield, built in 1900 by W. F. Brevard now owned and occupied by Bill Smith, Mr. Brevard’s grandson. * McKnight House in Auburntown owned and occupied by Josh and Amanda Davis. * Lynn and Dottie Baskin’s home on Hoover Road near Parsley’s Market. * Gary and Jackie Prater’s home at 108 Auburntown Road, Woodbury. * Joe and Teressa Tate’s log cabin and restored country store in downtown Readyville. * First United Methodist Church, High Street, Woodbury, where an array of beautiful and unusual nativity scenes will be on display. * Junior Brandon’s log cabin on Burt Road, featuring ham and biscuits (last year they gave out over 300 ham and biscuits). * Readyville Mill where owner Tom Brady and gang will welcome all visitors. Tickets for the visits are available from any Lions Club member. The price is $7. Those planning on making the home tour should first go to the Lions Memorial Building in Woodbury to get directions to the homes. Tickets for the tour will also be available at the Lions Club building.